Sound Connections’ Peer Learning Scheme is a series of work-shadowing placements undertaken by practitioners and hosted by Challenging Circumstances Music Network (CCMN) member organisations. CCMN member organisation Good Vibrations is providing the opportunity to observe a gamelan project in action at HMP Chelmsford. 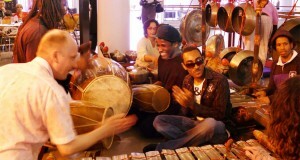 You will watch experienced facilitator, Nikki Kemp, help a group of male prisoners learn to play the Javanese gamelan orchestra and you will also see punk artist Kieran Plunkett support the group to gain Level 1 Open College Network qualifications in team-working through the experience. There is an abundance of fascinating academic research on the impact of Good Vibrations courses. There is space for one person to observe one day of this course, which is running from the Monday 18 -Friday 22 September 2017 (subject to the person’s visit being approved by the prison when they have your full details). This placement is offered via the Sound Connections Peer Learning Scheme. To apply, please complete this form and submit it to tej@sound-connections.org.uk. Sound Connections can cover travel expenses to and from HMP Chelmsford in return for a short write-up of your experience.